These TV Stands Feature Tilting VESA Brackets For A Mount That Is Sturdy And Will Fit Almost Every Type Of Flat Screen Monitor! 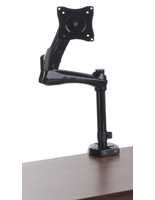 Thousands of Wide Screen Stands Are Shipped From Our Stocked Warehouse Daily! These TV stands have a 200 x 100 VESA bracket that fits most televisions from 23" to 30" and weighs less than 50 lbs. We ship the hardware to mount the television with the bracket, but some TVs will require other screws that you can obtain from your local hardware store. 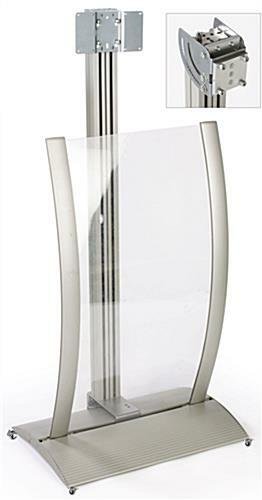 TV stands, also known as a widescreen stand, have a hollow pillar to hold your television. You can place the wires coming from your television into the pillar to keep them out of view by placing them through four (4) included plastic strips. 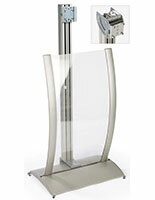 These LCD stands, TV stands feature a curved poster frame on the front of the display. This poster frame holds an 18" x 37" graphic, and uses two (2) lenses to keep graphics in place. 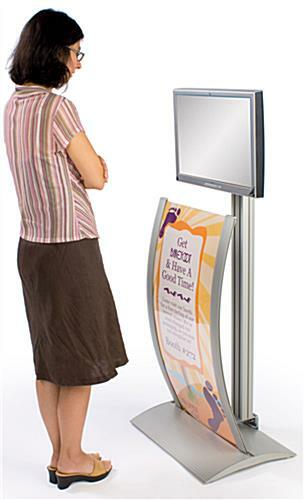 Plasma stands, TV stands are excellent choices for trade shows, malls, and retail stores wishing to grab customer's attention in an exciting new way. 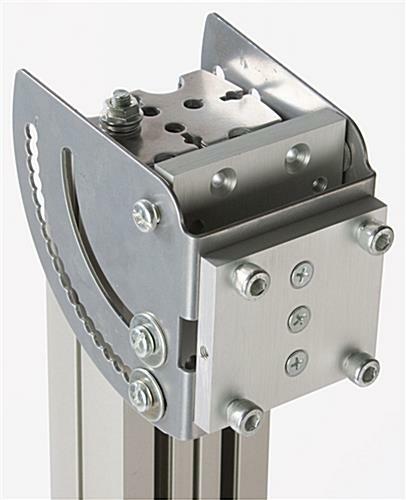 These TV stands also come with a tilting bracket. By angling the television using this bracket, passersby can better view the screen. 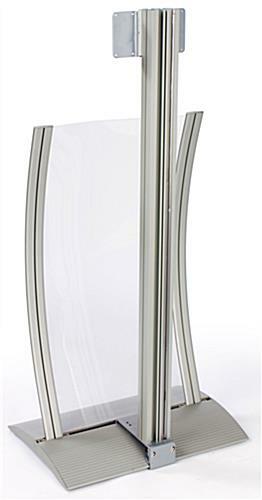 TV stands, like an LCD stand, are made of durable aluminum. Rust proof aluminum holds up well in heavily trafficked areas, and its satin silver finish matches wonderfully with any setting. These TV stands are on a wide base to offer more stability for your television. These flat panel displays are the perfect TV stands, merging technology with a traditional poster frame to promote your business in the best possible light. Please Note: Graphic is not included with display. When designing your images, keep in mind actual graphic size is 18"w x 37"h, where 1/2" on each side is covered. Your graphics should be printed on regular poster paper, so as to ensure they will fit securely within the grooves. This will not be a problem for any printing service facility.